It was so lovely to see you this year. Last year I spent your month in Malawi, which was amazing, but it meant that I missed the beautiful changing of the seasons. October, you have been that wonderful in-between time before the weather turns icy, where the air is slightly crisp but the sun is still sharing it's warmth. You really brought it this year October. The weather has been surprisingly pleasant and the changing colours of the leaves have been more vibrant than ever. I've been walking my dogs in the early evening just in time to catch the beginnings of the beautiful sunsets you've been gracing us with all month long. I haven't minded that it's getting darker earlier and earlier because it's a wonderful excuse to clock off and snuggle under a blanket. I absolutely loved doing blogtober but I must admit I am quite relieved that it's over. I worked a little too hard last month to get blogposts up every day. I know from a reader's perspective a small post every day doesn't seem like much but it's so much more than that. It's making sure you get all your photographs taken during the increasingly dwindling daylight hours, then editing those shots and planning and writing every post to make sure they go up on time. As well as every single day there were quite a few nights spent working long after dinnertime and when I did have some downtime I felt guilty about it and felt I should be working on something. As a result I didn't get a lot of reading done, as you'll see in my monthly wrap up, and didn't even really watch any tv programmes either. It's been awesome to feel so productive and get a great response from blogtober but I'm looking forward to a little bit of a rest for November. You came bursting onto the scene this morning with blue skies and a low but warm autumn sun. I can't quite believe that it's November 1st and I still haven't worn a coat yet. The weather has been so unseasonably warm that today I went for a morning walk with no layers over my jumper and I was still pretty toasty. 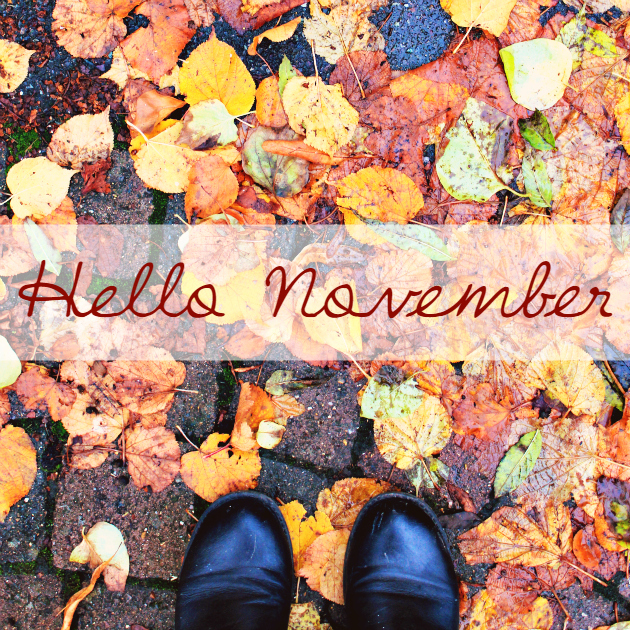 You, November, are the month of excitement, possibility and anticipation. I love your month because it's the month I was born. I'm an autumn baby and I think that's why I feel a special connection to this time of year. I love the timing of my birthday (November tenth) because it's beacon of joy between the dying down of Halloween and the start of the Christmas excitement. I'm not the biggest birthday person but it's always nice to feel a bit special for a day and spend time with my favourite people. This year I'm going up to my old university city, Newcastle, with my boyfriend, to have dinner with a friend and go to see a drag queen show. I'm ridiculously excited. We're going to see Haus of Edwards, and if you haven't watched Ru Paul's Drag Race then you're seriously missing out. Although I've been enjoying the unexpectedly warm weather, I'm excited for the colder weather that November promises. On my early evening dog walk, I watched the mist creeping in over the fields, a sure sign that frosty days are ahead. I'm excited to wear my new coat and fluffy socks with boots. I'm excited to wave sparklers and watch fireworks, preferably whilst clutching a hot chocolate and a hot dog with extra onions. Come at me November, I'm ready for you.